In the 90’s my sister had a thing for lace up heeled boots. She had two pairs, one in black and one in white. We called them her witch boots and obsessed over their powers. Like a traditional little sister, I wanted needed my own pair. One day at school a boy took her shoes and shoved them down the toilet. She never wore them again… but this little sister’s dream of having her own lace up boots was never flushed away. Enter: By Far’s Becca boots. By Far shoes sell out fast. When I found a pair of Becca Boots on FWRD in my size. I panicked and hit check out fast. Unlike magic, I don’t believe in trends. 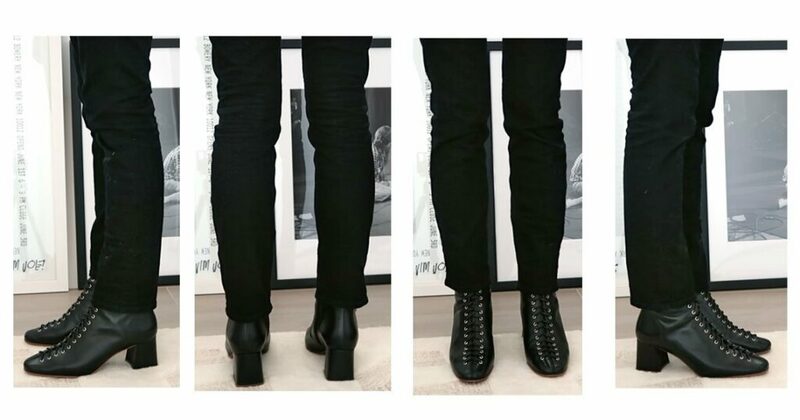 Is a $500 relatively trendy boot worth it? Let’s investigate in this By Far shoes review (also included: Tanya sandal sizing). I ordered my Becca boots in an EU/IT 39. For reference, my standard shoe size is an FR 39 in Isabel Marant Dickers, Hermès Oran Slides, or Chanel ballet flats. In Repetto flats I take a FR 39.5. When given the option of half sizes, I’ll take it, but otherwise I stick to a FR 39. By Far’s size 39 fit perfectly with a super thin sock. If you want to wear these boots with a thick sock, consider sizing up. For American shoes, I’m generally an 8.5 in Nike running shoes and my Adidas Stan Smiths are a US 8. The Becca boots’ shaft is 6 inches. On me, at 5’5.75”, they hit 1/3 of my calf. I retain water like an elephant retains a memory. It’s especially bad in my feet and lower legs — i.e, my calves… but, when you loosen the laces just a pinch, it alleviates a lot of the pressure. This review is mainly about the Becca boots, but they weren’t my first pair of By Far shoes. This summer I bought a pair of Tanya sandals in a size 39. They fit perfectly… but ultimately, I wasn’t obsessed and returned them. By Far’s Becca boots are made from ridiculously soft 100% Italian Calf Leather. You don’t need to be precious with them, but because they’re calf leather, they scratch easier and wear wrinkles will show up sooner. Between the trapeze block heel and its 2.5 inches height, these shoes are easy and comfortable to walk in. Would I go more than 5 miles in them? I could, but I wouldn’t. The sole of these boots are hand-crafted and hand-painted leather, so they’re not all-terrain-or-weather-or-distance kind of boots. If you want more mileage, bring them to a good cobbler and add a sturdier sole. Going to & from a car: 0% chance — No blisters. Light Walking (ex. 12 blocks to/from Whole Foods): 17% chance — Ultimately, you’ll get the lightest rub. Heavy Walking (ex. The kind of walk where you keep asking “how many more blocks?” every block. ): 67% chance — Gentle blisters that are annoying, but at least they won’t pop. –Heel Height: The trapeze cut block heel is 2.5 inches or 65mm, a perfect amount that adds some height but is still comfortable. For comparison, this is half an inch higher than Isabel Marant’s Dicker boots. –Zipper: With the 6 inch shaft it’d take a lot of effort to keep lacing these boots up. By Far added a zip so you can easily get them on or off. –Zipper: … while the zipper makes these boots easier, it’s an easy way out. No zipper would have made them more ~authentic~… but also less wearable. –Minimal Breaking in Period: No terrible blisters to report. –Hard To Wear: My legs do not go on for days, so for me, the sun sets on wearing these Becca boots with short dresses or mini skirts — unless it’s with tights. If By Far’s Becca boots was a TV show, it’d be called “Witches of Melrose Place.” Eg. all of our 90’s-redux dreams come true. Does that mean that these boots are too trendy? Nope. If you want a little magic in your life, MyTheresa has the best selection of By Far shoes followed by Net-a-Porter. Any questions about sizing or quality? Let me know in the comments below! 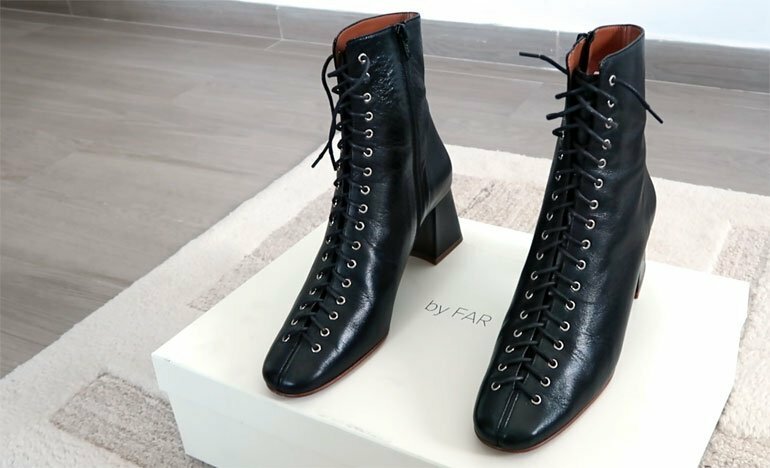 -You can get your pair of By Far Shoes on sale if it’s your first purchase on FWRD’s app with code IPAD15 or iPHONE15. Intermix also carries By Far and does 15% off your first order if you sign up for their email list. -Now & then By Far shoes are listed on The Real Real where you can save a lot of $. Get $25 off your first purchase with my referral code and save money and the environment by buying it secondhand. -Between sizes? Size up, By Far shoes are only in whole sizes.